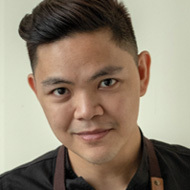 This Filipino chef, Miko or Michael Aspiras, has had a short but intense career, making the most of the training tools at his disposal to develop a professional career in which he has increasingly sought a vanguard culinary spirit in his pastry making. So much so that he has had the opportunity to present his work at different culinary summits. The culinary vision on the one hand and vindication of native ingredients on the other are two of his main concerns at present, without losing sight of his love for the competition arena, in which he has participated both as a contestant and as a coach.